We listen to our ranger guide. He tells us Katherine Gorge is Nitmiluk, Land of the Cicada. I like the name. I can hear the cicadas chirping in it. The park has thirteen gorges. We only have a few hours to spare so we decide to see two of them on a tourist boat trip. Dying trees surround the jetty where we board our boat. They bend and sag, weighed down by fruit bats, or flying foxes. Thousands of the bats cling upside down to the branches, wrapping themselves tightly in their wings, like miniature vampires in their black capes. “No, no”, calls back our ranger guide. “It’s good for the trees. 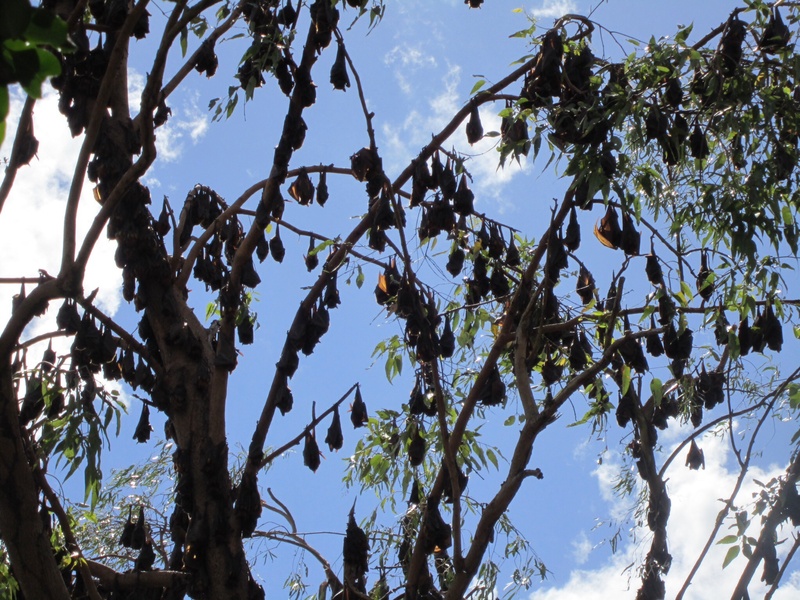 The bats prune them and fertilise them with their dung. They grow back to be much more healthy. When the bats have done their work here, they will move on and do some gardening for us further upstream. That’s how the system works. Everything has its place”. The boat glides through the clear water between the towering amber red rock faces of the gorge. We shield our faces from the intense heat of the sun. The water sparkles and shimmers ahead of us. In the Wet, the water is 7-8 metres higher than it is today. The guide points out the marks on the sandstone rocks above us. White, black and red ochre stains streak down the rocky walls, as if a giant artist has daubed paint brushes up and down in a frenzy of earthy colour. The rocks glow as we glide past, then darken as they fall into shadow behind us. Hardy trees sink their roots deep into crevices in the sandstone to find moisture and nutrients. Somehow they succeed and make their precarious homes on the rocky ledges above us. Twisted and knarled, they survive and provide shelter in the gorge for bird and insect life. 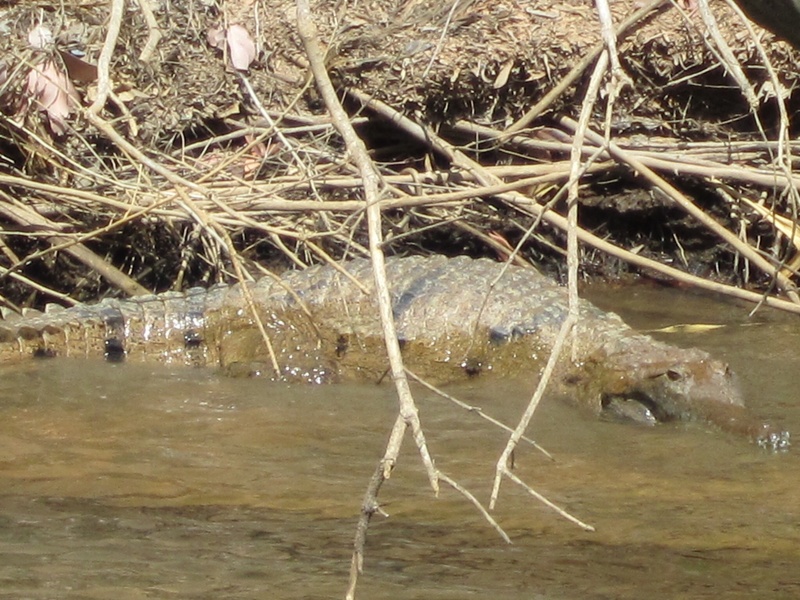 A crocodile lies snoozing on a small sandy beach to our left, her silvery scaled skin reflecting the sun’s rays. “Don’t worry, she’s a freshie, a freshwater crocodile. She won’t do you any harm. She might put a few holes in your arm if she’s rattled, but they only eat what they can swallow whole. You are quite safe”. I glance at the toddler sitting sleeping in his mother’s arms in front of me. Sleep safely little one. Saltwater crocodiles on the other hand are extremely dangerous. “Salties” enter the gorge in the Wet, when water is flowing into the park from the estuaries where they normally live. Some of these prehistoric predators are left here when it stops raining and the water goes back down, closing off their exits. This is not great for tourism. The park rangers put out traps and relocate any they catch before the park is opened to tourists. “We always feel a bit nervous when we send the first canoeists out there”, the ranger guide jokes. We all stare at the trap he is pointing towards and hope he really is joking. We have to transfer to another boat half way through the trip, because the water is too low in the dry season to pass through to the next gorge. Our walk along the side of the gorge to reach the second boat passes an example of Jawoyn rock painting that is around 8000 years old. There are paintings dated 25,000 years old in other places in the park, we are told. They are some of the oldest artefacts in the world. I find these periods of time almost impossible to imagine. The first fleet came to Australia in 1788, not much more than 200 years ago. We are so new to this land compared with our guide’s people. Our history here is recent even by our own Western standards. I sit and ponder this as we glide further into the gorge. There are many paintings in the park that are kept secret as they mark sacred places. The painting we pass by is different. Rock art was also used to communicate information to travellers. It told them the type of food available and any fresh water nearby. We are reading signposts and tourist information maps from another culture. In the second gorge the guide slips the boat into a small cave to one side. “Listen”. A high pitched squeaking sound reveals the presence of a population of tiny horseshoe bats. They snuffle around as we approach, keen to be left in peace to continue their siesta. They are the modest, shy cousins of the fruit bats we left back at the jetty. Canoeists in yellow life jackets paddle by. Children shout and splash as they dive laughing into the water from a rocky ledge. Two men are fishing. The park is well used. As the boat turns back towards the jetty, I look up in wonder at the beauty around me. It really is magnificent, how lucky we are that the Jawoyn have chosen to share it with us. This entry was posted in Going home and tagged Australia, Katherine, Katherine Gorge, Travel on 06/06/2014 by Deb McSephney.